Back in summer 2009, I started to volunteer at LHSA in order to gain experience of archive work before deciding to apply for professional training. I was LHSA’s first long-term volunteer: by the end of my placement, I managed to arrange, rehouse and catalogue a substantial paper and object collection (http://www.lhsa.lib.ed.ac.uk/collections/GD18/gd18_index.htm). In fact, I liked it so much that I returned in 2011 to volunteer with another two personal collections, one centring on mental health oral histories and another on respiratory health. Since my first contact with LHSA, we have offered numerous volunteer placements (and recently two paid internships): many volunteers have an interest in or are already undertaking professional qualifications in information management or conservation. Now, those who contact the Centre for Research Collections (CRC) to volunteer with us are offered an archive’ taster day’ through which they learn about the varied work that LHSA does and the records that we care for. I think that this day is a brilliant idea – it gives prospective volunteers a chance to look at different aspects of our role to see if an archive environment is really for them. Conversely, archive staff can make sure that they offer the right opportunities to the right people. After a tour of the stores, the day started with training on research for archive enquiries. Although I have been working at LHSA for almost a year now, I catalogue very specific collections, meaning that I don’t undertake general enquiries work or deal on a regular basis with a large range of our records. Researching family history enquiries with the help of Stephen, our Archive Assistant, taught Iain and I about the trail that is followed to track down individual patients, from patient and staff registers to admission papers and case notes. The day continued with an introduction to conservation photography, using LHSA’s digital SLR camera to help Stephen to take photographs of letters written from the Royal Edinburgh Hospital for an upcoming exhibition. Iain and I busy with research on enquiries…. 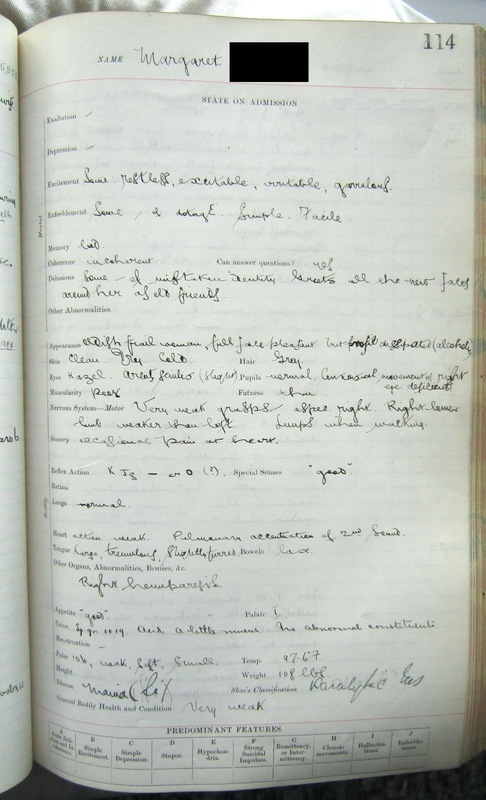 After lunch, we started work on indexing the casebooks of the Royal Edinburgh Hospital. These casebooks are heavily used by medical and family historians, so creating a searchable index to them allows us not only to find individual patients extremely quickly, but also to search details such as age on admission, patient occupation and medical condition. 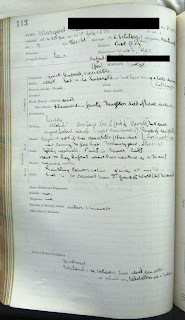 You can read more on the project in last week’s blog post: http://lhsa.blogspot.co.uk/2013/08/royal-edinburgh-hospital-reh-case-book.html. Finally, I introduced Iain to the neurosurgical case notes with which I work (http://www.lhsa.lib.ed.ac.uk/projects/Cataloguingcasenotes.htm), this time wearing my hat as a member of LHSA staff! I had a wonderful day, reminding me of how lucky I am to work in such an enthusiastic and resourceful team - and with such generous and enthusiastic volunteers! It’s been a while since we brought you news of what’s happening on this front, and a lot has happened since the project started in May 2012. For anyone new to the project, we (well, strictly speaking, our volunteers!) are creating a database which lists every patient admitted to the REH from 1840 - 1932. The information is taken from the case books, approximately A4-sized books each containing between about 800 and 950 pages. From volume 25 onwards, there is a two page pro forma to be completed for each patient where the physical and mental state of each patient on admission is recorded, as well as some basic biographical information. There are a further two pages assigned to each patient to note the progress of their case. If a patient was in for a long time, extra pages were allocated further on in the volume, and sometimes on into several volumes. Prior to 1840, case notes were not kept; from the 1930s onwards, the modern system of individual folder-based case notes was introduced. Almost all of the case books between 1874 and 1894 (ref: LHB7/51/25-61), and a few earlier ones, have now been added to the database and this translates to 5,784 entries in the database. For each patient, their name, age, occupation and diagnosis are all recorded, as well as dates of admission and discharge or death. The occupations listed reveal the wide range of people who received treatment at the Hospital: a Lieutenant in the Bengal Cavalry, housewives, tailors, drapers, medical practitioners, blacksmiths, domestic servants, governesses, teachers, railway porters, seamen, a conjurer, hawkers, students, millworkers, dressmakers, nurses, foresters, publicans and a Baptist minister…a multitude of skills which the Hospital put to good use in its early forms of occupational therapy. Over 11 volunteers have worked on the project so far, and we’d like to extend our thanks to all of them for their hard work, palaeography and detective skills! This week we focus on East Fortune Hospital. During the First World War an airship station and airfield were built in East Fortune, Drem, in East Lothian. After the War there was an upsurge in cases of tuberculosis (TB) and before the development of antibiotics, treatment was best carried out in sanatoriums in countryside air, away from populated areas to prevent the infection of others. The airfield, with its rural location and good road access, therefore was an ideal location for a TB hospital and East Fortune Hospital was duly opened in 1922 using part of the site. During World War II, East Fortune patients were transferred to an annexe of Bangour General Hospital. From 1956, mentally handicapped children began to be cared for at the hospital and at the same time, concerted efforts in the cities of Scotland to identify and treat the majority of people with TB early resulted in a corresponding reduction in such patients at East Fortune. From 1974, the Hospital came under the control of the North Lothian District of Lothian Health Board and in 1997, East Fortune finally closed and its remaining patients were transferred to Roodlands Hospital, Haddington. 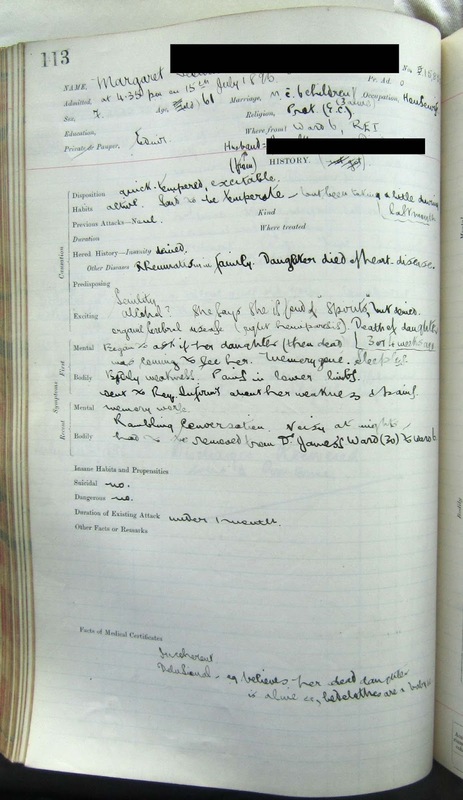 LHSA’s records consist mainly of patient admission, discharge and death registers and a small number of case notes covering the years 1922 - 1974. Some photographs have also recently been accessioned and the images from approximately the late 1950s show staff and patients gathered round a newly constructed ornamental garden in the grounds of the hospital, with its distinctive huts in the background. It is a few weeks ago now that we took part in ‘The History Room’ in the Royal Edinburgh Hospital. Organised by Artlink, this was a special one-day event to commemorate the Hospital's bicentenary, and brought together staff, patients, and members of the community to learn more about the Royal Edinburgh's past. We took along the first minute book, nineteenth-century editions of the Hospital magazine, the 'Morningside Mirror', photos and annual reports to exhibit alongside the memorabilia collected and held by the Hospital. ‘The History Room’ was fantastically well-attended, and was a great opportunity to talk to people in the Hospital and wider community about the LHSA collections and the work we do to protect and promote them. It was so successful that 'The History Room' is being brought back by popular demand! On 6 September there will be a second chance to see it, to coincide with the Hospital’s fete. For more information please click here - we hope to see you there! At present, I am cataloguing case notes created by neurosurgeon Norman Dott during the Second World War. During this period, Dott split his time between the Royal Infirmary of Edinburgh and Bangour General (Emergency Medical Service) Hospital in West Lothian. Dott had two surgical teams working to assess and treat military cases in Bangour whilst still working at the Royal Infirmary with civilian cases. Civilians would be assessed at the Infirmary and then transferred to Bangour for operation if one was needed. The Royal Infirmary civilian cases might seem to be less gripping than the casualties of war treated by Dott at Bangour, but nothing could be further from the truth. Rather, they chronicle life on the home front and the unintended results of wartime necessity – they represent a different kind of wartime casualty. For example, Dott commonly faced injuries sustained during the blackout, when a lack of street lighting could make a step off a tram hazardous and crossing the road after dark into a real undertaking. Inexperienced military drivers also created accidents and injuries. In this period, Dott treated a great many patients from reserved occupations, such as miners who suffered head and back injuries through accidents in the course of their dangerous work. The war also had a clinical effect since even previously common medicines suffered from wartime shortages, and hospital staff members were stretched to the limit. In one 1944 case, a woman was described as “an indirect victim of the Second Front invasion” when her operation to reduce the pressure in her brain caused by hydrocephalus went disastrously wrong. The Second Front invasion began on 6 June 1944, when Allied troops launched their invasion of occupied France in Normandy (the D-Day landings). The hydrocephalus operation also took place on this date. Half of Dott’s staff had left to meet expected military casualties on the previous day, and so the operation was left under-resourced. The patient died from pentothal poisoning, which had been administered as an anaesthetic for too long a period since the operation had been delayed by hours due to inexperienced theatre staff not making correct preparations for the procedure. In these wartime case notes, the ways in which conflict touched people’s lives are ever-present, from mothers contacting Dott to urge him to write letters exempting their children from being called-up to accounts of evacuations, bombings and wartime home service. These details demonstrate the value of Dott’s case notes as records of strained social and economic realities – which could not help but effect clinical ones. 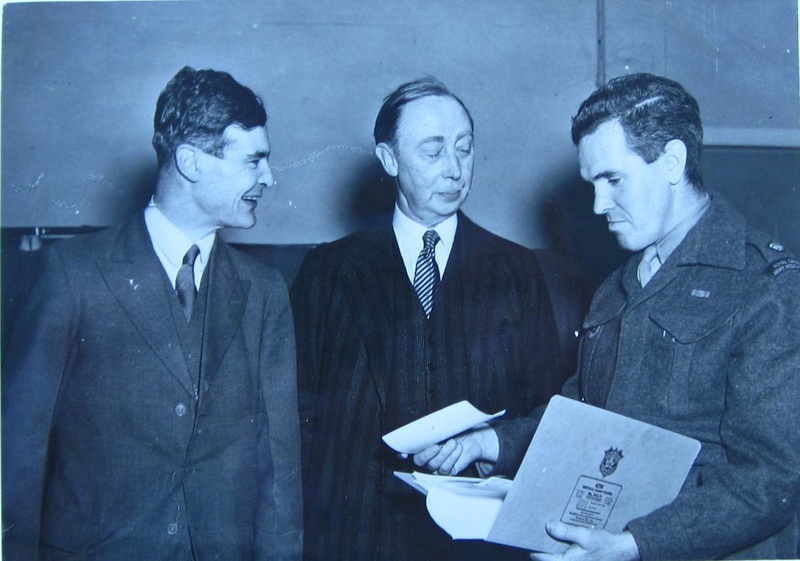 Image: GB237 Coll-32/A14 Dott (left) and Manchester neurosurgeon Sir Jeffrey Jefferson (centre) meet a Canadian medical officer at a meeting of the Society of British Neurosurgeons, 1944.